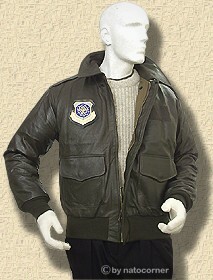 Original flight jackets from the 80´s, genuine rarities. 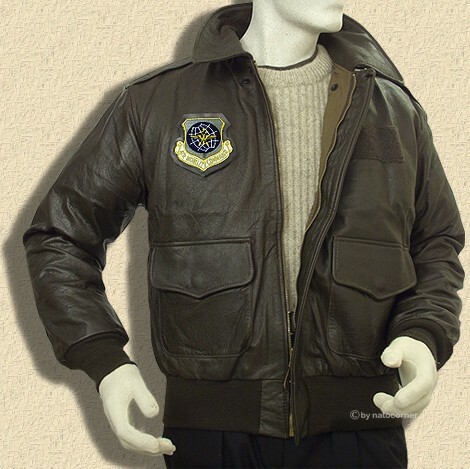 These goatskin jackets are the legendary A2 pilot jackets of the tuskegee airmen. 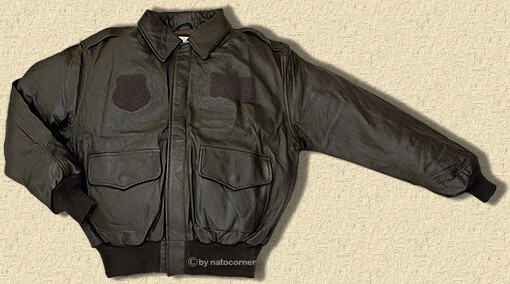 We also offer the B3 bomber jacket, B-3 -a genuine lambskin jacket- worn in the world war II. 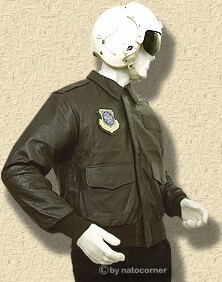 A2, the legendary pilot´s jacket of the USAF. 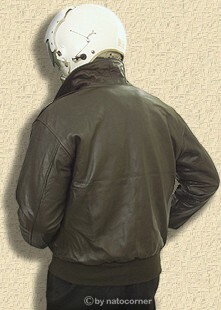 As a successive model of the A1 the A2-jacket was introduced in 1930 and produced till approximately 1942. In addition to the B3 which was designed for the use in upper airspace (bomber pilots, reconnaissance pilots etc.) 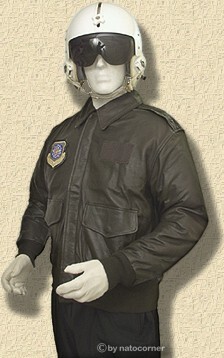 the A2 is the jacket of combat and fighter pilots. This jacket became a myth (just like the B3-jacket) and vouches for freedom and tolerance. Nearly every A2 was decorated by its owner with art work on the back. -in times of war a bold attempt. ­often a loan of the owners honouring the tasks and the fight for freedom and tolerance. The A2 was designed for aggravating circumstances in open cockpits. With a speed of more than 135 knots an open cockpit presents wind conditions of heavy storm. Especially for the airmen and air gunners who partly still worked standing upright in the air stream, floating clothes could do a lot of harm. Therefore the A2 was fit out with press buttons to fix the collar ends. Additionally there was a hook to keep the wind cover above the zipper closed. The pockets as well are to close with press buttons now. Even after bloodcurdling flight manoeuvres the content of the pocket was on its old place. The use of a zipper was a revolutionary innovation. The previous model, the A1, was buttoned up ­hardly practicable when flying. Knitted waistbands were set to avoid ´blown- up-jackets´. With jackets of the US-armed forces the shortwaist always attracts attention. While today this is taken as a fashionable feature -the origin of these short jackets based on the fact that the jacket won´t slip underneath the `posterior´ when sitting down. Circumstances like that are not only uncomfortable but also extremely restrain from moving. Moreover a crumpled jacket doesn´t look cool really ­not so very helpful to wearer´s authority either. 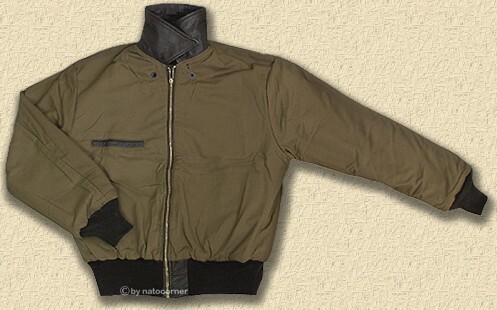 In the 80´s this jacket was reproduced -according to original specifications. The quantity was quite low depending on the incoming order. At the beginning/middle of the 90´s the production was stopped again. As a little concession and to mark the reproduction as such the jacket was garnished with a special sticker, the patches for the pilots names and their units. Like it´s reproductions of the 80´s the original A 2 is made of goatskin, a kid skin (no goat chamois-leather) that is incredibly resistant and steady. Worked up as full leather it is made for eternity. With a progressive wearing for years the appearance of the jacket changes from ingenious to simply wonderful. Even features like the press buttons to fix the collar and hooks to keep the the wind cover close were continued. 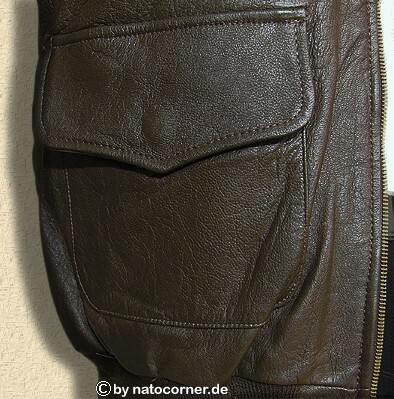 In 1930 the application of a zipper was marking a new epoch, like usage of nomex fibres in the 60´s. The A2 has an inner pocket and two outer pockets and the lining is extremely steady. some rotten folks are spoiling for this rare jacket. We have access to a limited number of A 2 jackets which come from productions of these small series. 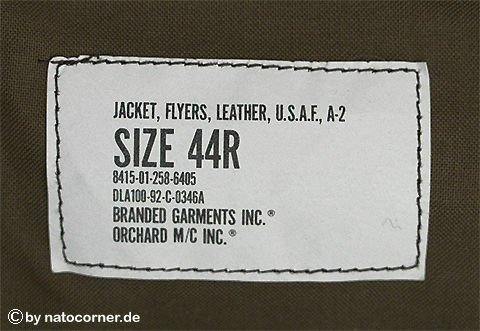 All A2-jackets are made in USA years ago, but still unused. Aufgrund der Nachfrage nach diesen Jacken haben wir eine neue Produktion auflegen lassen. Auch diese neuen Jacken werden in direkter Anlehnung an die originalen A2´s gefertigt. These days the A2 is nearly only available as a wild copy. It is defaced with fur collar, crazy inner linings, odd leather types ­ and even more remarkable "leather qualities". There are no bounds between stupidity and variety. 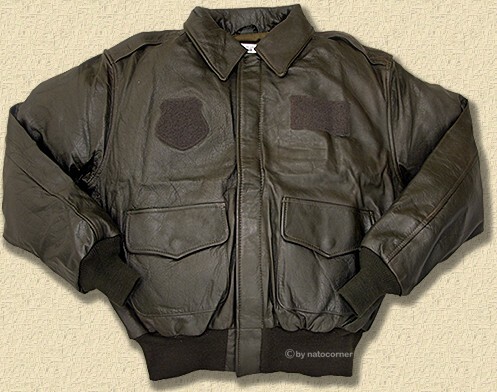 All these jackets may have their justification as pretty nice jackets but with reference to the original A2 -jacket these abuse is not to realize anymore. We measure our products before delivering them and equalize your specification according to it. So we make sure that your A2-jacket fits as perfect as possible. Therefore it is really important for you to appoint your exact size. It doesnt make much sense to order an A2 without exact specifications. That is why we ask for your kind attention. 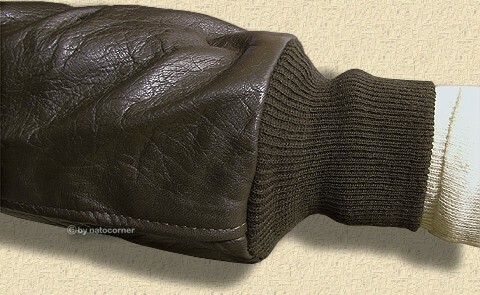 Goatskin is an absolutely excellent smooth leather. It is of high carrying capacity and even with it´s sealed up surface still breathable ­it is a homogenous unit. 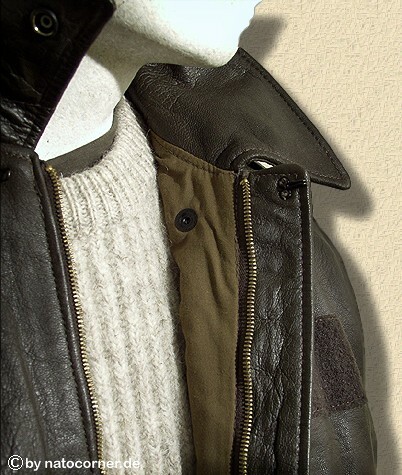 Therefore only faultless leathers with natural grown and perfect surface can be used for these jackets. The skin of an animal shows different quality areas. The perfect pieces are naturally rare. Additionally a goat is no cow and the available leather is by way of comparison rather small. The usable leather is strictly fixed. Goatskin has a tough structure and it is resistant to damages on the surface, which are hardly possible in daily use. With leather qualities, uppers and skiver also have to be discerned from each other. First step of production is the horizontal section of the skin for equal material strengths. Certainly the skin can also be split into several layers (how it is usual with cheap products). Whereas the upper side of the skin provides absolutely the top-grade leather, the lower side is of inferior quality. 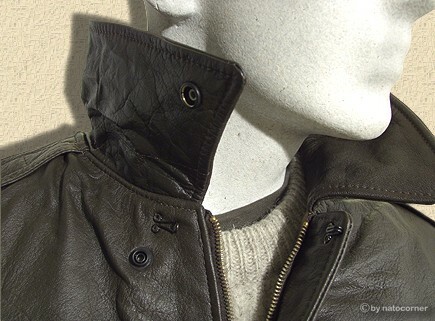 For these A2 leather jackets entire, solid, comlete leather only is used. So each single leather product is a testimony of life. Grains and several environmental influences from animal´s life remain visible and guarantee top quality. For the A2 -goat skin is first choice. As a soldier in the beginning of the last century aiming at the rank of an officer it was crucial to be native of a high social origin. Especially for the education required to become a pilot, it was essential to belong to the upper class. In fact the general opinion was, and it did not depend on nations, that intelligence and morals only exist in the nation´s elites. World War II completely changed this point of view. The demand for pilots was so high that exclusively using members of the upper class did not suffice. A venturesome project was started in the USA. It was an experiment that everybody supposed to fail, but virtue was made out of necessity. named after the training camp ­the Tuskegee institute. This institute was located in Alabama and the "Tuskegee-Airmen" were coloured men. An absolute monstrosity at that time, under the prevailing oppinion of considerable differences in intelligence and abilities between the human races. How described, the Tuskegee-Airmen only had two possibilities. (-all or nothing-) take it or leave it ! In fact ­as it is the nature of human history, the experiment became a huge success. As soon as a human being, either for moral or other reasons, is forced to record performance and decides to face the challenge, amazing results arise out of it. The Tuskegee-Airmen, who were gathered in the 332nd Fighter Group, consisting four units, and represented the biggest hunt-squadron. In fact, more than 900 pilots earned their wings and got their pilots licences. types P-39, P-40, P-47 and P-51, better known as Mustang. back on the ground they had to fight against race discrimination and prejudices. The results led to reduction of prejudices and discrimination in the USAF, not always, but from time to time. Many medals and decorations were given out. Three Tuskegees achieved the rank of a general and one of these remarkable men attained the rank of a 4-star full General. was the first coloured 4-star air-chief-marshal of the USAF. Congratulation! Because of their selfless engagement America loved the Tuskegees nation-wide. In WW 2 bombers exertions of the Allies often an exertion without return. While thousands of people died on the ground, bomber crews also started to return rarely. ­for all the immense arming these sky giants were rather easily to bring down. Bomber squadrons were accompanied by interceptors to fend off attacking fighters. the losses of the bombers were insignificant. The Tuskegees were in great demand again and soon called the "Redtail-Angels". All missions, where Retail-Angels were used as a security, went off without any losses. No single bomber plane was ever brought down. A success that has not been achieved since. This however was not the case for the Tuskegee pilots. Many of them fell during battles. That´s just one story given as a reason for the myth of the A2, a symbol for freedom and tolerance. Freedom and tolerance are virtues concerning us all. Leather lives ­therefore leather needs a little care. For lifetime pleasure it is important to grease the jacket with an appropriate dubbin from time to time. "Rapid" dubbin is available in brown and black ­and limpid as well. Firstly put on the care product with a soft cloth. Polish the leather after an corresponding on time. You save the leather from drying out. You also keep the sheen and the lissomeness ­for years. Please follow the care instruction that is included in every product unconditionally. ATTENTION: Always test leather treatment and care at an invisible spot ­the specialist also works like this. In a case of doubt address yourself to a company for leather care ­and get the treatment confirmed and guaranteed.
. If this page is imaged without NAV-Frames (e.g. of search engine functions) .